The internet is filled with blogs about cloth diapering. What works. What doesn’t. Which brands are best. How to wash. How to strip. How to DIY. It is all out there. I don’t really have anything new to add to the conversation surrounding cloth diapering, but I wanted to share an update on how cloth diapering went for our first year in case any of my friends are on the fence about it. My Current Stash: On the left are my dry wipes, wet wipes (in the container) and a wool changing pad I crocheted. In the center are my cloth diapers. In the right is Peatuk’s potty. Above is his diaper bag and one of his used wraps (they air out and are reuse 2-3 times before washing). 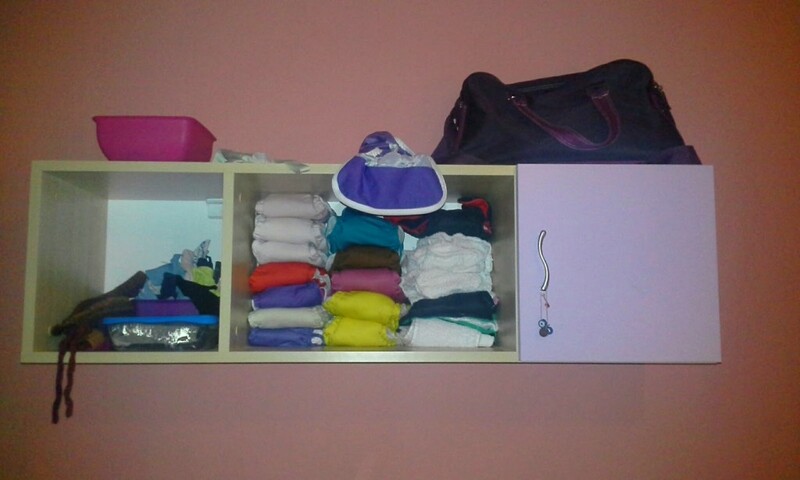 I started cloth diapering pretty much as soon as Peatuk was born. Before he was born, my mother-in-law bought the traditional Bulgarian diapering kit- 10 meters of cotton for swaddling and 20 meters of muslin for diapers. I crocheted and sewed a few wool diaper covers, and that was what we started with. 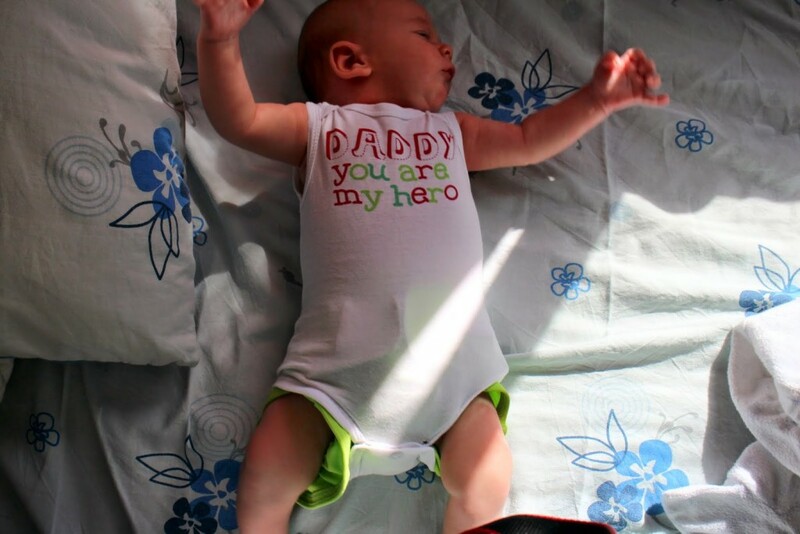 The first month or so, things went okay with cloth diapering. Babies that young poop an absurd amount, like 6-8 times a day. So that meant a lot of diaper changes. Sometimes we would use the wool wraps, but often, we would just have him in the muslin and wrapped cocoon style in the cotton and when he got wet, change the whole set up. We probably went through as many sets of clothes as we did diapers each day, which is kinda rough. I would have given up if I was doing it all on my own. Thankfully, at the time, we were living with my mother-in-law and she jumped in with tips on how to fold the diapers correctly and took over the washing and ironing of the diapers for me. It is a lot of ironing, and although it is not fully necessary if you are drying the diapers in the sun, they fit better next to the baby if you iron them into neat folds. Towards the end of this period, Nikola’s sister gave us the gift of two PUL wraps. They worked SO much better over the diapers than the wool covers, and that meant less changing Peatuk’s full outfit, which was a great thing. One of my wool covers. He was swimming in it, but it worked. My first pocket diaper was a gift from peleni.bg. It was a one-size little lamb pocket diaper, and I still happily use it. After that, I bought 12 fuzzibunz, 1 totsbots, 2 rumparoos, 2 charlie banana, and one “chinese cheapy” diaper. They are all one size pocket diapers and they all have their strengths and weaknesses. I bought them all second hand, as we didn’t have the money for new diapers, but I found that a lot of them had only been used a couple of times. It seems like a lot of people try cloth diapers and then give up. I did get a few fuzzibunz that went through a whole child from birth to potty training, and I cannot even tell which ones they are in my stash now, so they are holding up well. Unfortunately, about three months after I got them, the Charlie Bananas started leaking through the PUL. I couldn’t figure out the problem and I finally had to get rid of them. The totsbots leaked a bit too, but I washed it on 60 degrees and it started holding well again. I love pocket diapers because they are cheaper than all-in-ones and they are fast drying. My fuzzibunz take about one hour to dry in the winter, less in the summer. Stuffing the inserts can be tedious at times, but I find them worth it. 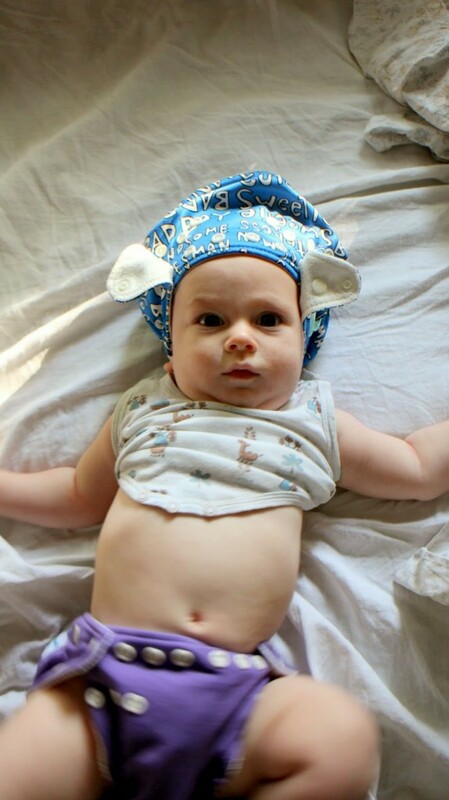 The Charlie Bananas made great hats, and I loved how soft they were, but the fuzzibunz did better as actual diapers. When Peatuk was about 7 months, he started urinating in greater quantities, and so I tried bamboo fitted diapers with my PUL wraps over them. They soak up an amazing amount of urine, but I do not like the shape they dry in and it takes them all day to dry. Although I love natural fabrics, I will always recommend sticking with microfiber for diapers unless you are using a dryer for your inserts. However, since I pulled out the wraps again, I decided to try the cloth diapers I had sewn from old t-shirts. They work very well in the wraps with a thin piece of fleece between Peatuk and the diaper, and I still have about 6 of them in my rotation. Of course, I favor my fuzzibunz, but I find that these work well in a pinch. You can see the bright green PUL wrap sticking out. Now that it fits him better, we use it a lot more often. However, it made flats a whole lot easier in the beginning. I would definitely recommend a few wraps. When we are around town, we generally stick to cloth diapers. Since I have doubled up the soakers in each diaper, Peatuk can wear one diaper for about 4 hours without needing a change, and we are rarely out much longer than that. I keep a diaper, the wet bag, and some dry wipes in my purse, just in case. When we are traveling for longer periods of time, we generally buy a bag of disposables. I will admit that every time we buy disposables, it is difficult to get back into the rhythm of cloth. Cloth requires extra time buttoning and more time washing and it is ultimately easier. However, when the disposables run out, our finances always steer me back to cloth. Peatuk’s favorite diaper is no diaper. I use the Rocking Green diaper detergent and occasionally a sanitizer from mio fresh. I use 2-3 tablespoons of detergent an I rinse, wash, rinse, all in cold water. This worked well until this month (11 months old). However, lately the diapers have been holding a stink, so I am switching it up. I am going to start using a hot wash and keeping the dirty diapers in a wet bin as opposed to the dry bucket I usually keep them in. Recently, I started making my own wet wipes because Peatuk goes through a ton and we always seem to run out. I use a plastic container and put 7 drops of lavender essential oil and 5 drops of vetiver. I mix the two with a teaspoon of olive oil and then fill the container halfway with room temperature water. Then, I put in old scraps of t-shirt that I have cut into appropriate sized squares. Some of them are doubled up and sewn, from when I had time for such things (pre-birth) but although they look better they don’t work any better. The fabric soaks up the water and I turn them over. I try not to make more than 10-12 at a time, because they can get mildewy if they stay wet for too long. They usually last me 1-2 days and then I make up another batch. That’s my experience with cloth diapers. It has been very economical and not nearly as difficult as I expected it to be. Of course, there are hard days and a bit more trouble shooting than is necessary for disposables.